Inspire kids to become lifelong readers with Panel Power, a CBLDF resource that provides an introduction to comics and background on why they’re good for kids! You can find the issue at comic book stores across the nation, on comiXology, and below! You can also get bundles for your store, school, or library in the CBLDF Rewards Zone. 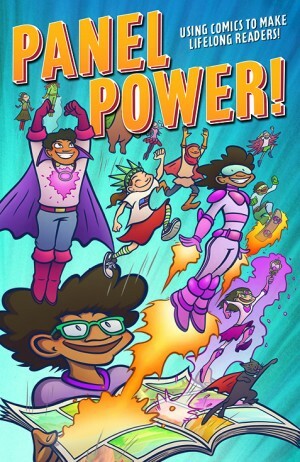 A tool for battling misconceptions about the format and filled with information about the benefits of comics, activities, and reading recommendations for engaging kids with comics, Panel Power is an essential resource for retailers, educators, librarians, and parents! Panel Power features all new cover artwork by Matthew Loux (SideScrollers, The Time Museum). Panel Power is made possible with the support of the Gaiman Foundation and CBLDF’s Corporate Members — ABRAMS, Black Phoenix Alchemy Lab, BOOM! Studios, comiXology, DCBS, Diamond Comic Distributors, Dark Horse Comics, DC Entertainment, FAKKU, IDW Publishing, Image Comics, Half Price Books, Oni Press, Penguin Random House, ReedPop, TFAW.com, Scholastic, SPX, Valiant, and the Will and Ann Eisner Family Foundation — and members like you. Thank you!